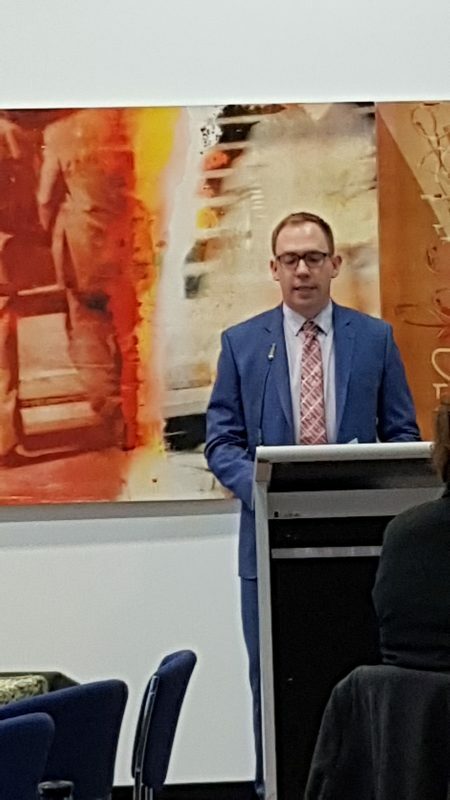 On Tuesday 19 June 2018, SCoA CEO Nick Tebbey spoke at the ACT Government’s Refugee Week event, discussing the contributions of refugees to Australia as well as Australia’s role in addressing the growing global humanitarian crisis. You can read his speech below. I would like to acknowledge the traditional owners of the land we meet on and pay my respects to their elders, past, present and emerging. Given the occasion on which we meet today, it is important to acknowledge Australia’s long history as a nation of migration and to understand the crucial role of our First Peoples in sharing this land with those who have come across the seas. With that in mind, it is my honour to be here today to address you on the eve of World Refugee Day, and to note its theme: With Refugees. This morning I’d like to unpack that theme briefly, and not only to share with you my thoughts on the role Australia plays in addressing one of the world’s most compelling humanitarian crises, but also to recognise all that Australia stands to gain through maintaining its strong and welcoming humanitarian program. In short, by making sure we truly stand “With Refugees” there are mutual benefits to be enjoyed by all. UNHCR estimates that by the end of 2016, 65.6 million individuals were forcibly displaced worldwide as a result of persecution, conflict, generalised violence or human rights violations. Of this group, 21.3 million people were recognised by UNHCR as refugees in need of protection, however only about 100,000 are resettled each year to settlement countries such as Australia, USA, Canada etc. In the 2017/18 financial year Australia will have granted 16,250 refugee protection visas and the federal government has announced plans to increase these numbers to 18,750 for the coming year. These numbers are a drop in the ocean when one considers the vast majority of refugees awaiting resettlement or repatriation in refugee camps, or seeking temporary accommodation in neighbouring countries. With that in mind, Australia plays a pivotal role in supporting other nations through aid, education and other forms of support, to house, care for and ultimately settle refugees with dignity and respect. In this regard, Australia plays a large role on the global stage, through mechanisms such as the UNHCR’s Annual Tripartite Consultations on Resettlement, the ongoing negotiations for the Global Compact on Refugees and the Comprehensive Refugee Response Framework. I should pause here to note that there is a less welcoming aspect to Australia’ refugee response, and it would be unhelpful of me to ignore the plight of asylum seekers in Australia. Millions of people seek asylum across the world on a daily basis. In Australia we receive a very small number of asylum seekers – largely because of our geographic characteristics and of course the government’s well-publicised hard line approach on those arriving by boat. Despite the small numbers it is this group that attracts the most attention in media and politics and has, over the past decade or two, become a valuable political tool. Depending on their date and method of arrival, asylum seekers in Australia have either been relocated to offshore detention on Manus or Nauru, or permitted to remain in Australia on a bridging visa until their status had been resolved. A number of these asylum seekers and, more recently, holders of Temporary Protection Visas and Safe Haven Enterprise Visas are located here in the ACT and like those who live here on permanent humanitarian visas, are beginning to shape themselves as active and welcome members of the Canberra Community. On that note, I should add that of the 20,000 odd refugees arriving in Australia through our permanent resettlement program annually, just over 1% are settled in Canberra. Maybe that number will surprise you, especially since across the border NSW receives almost 40%, but I suggest you think of it this way: that 1% represents 200 new Canberrans who, each year, bring their resilience, experience and capacity to contribute to this city. With that in mind, there is little doubt that Canberra, and Australia more broadly, stands much to gain through the maintenance of a healthy humanitarian programme and, for the 20,000 odd refugees resettling here each year, the possibilities are boundless. The contribution of migration to Australia must not be undervalued. Migration contributes to the social and economic vibrancy of Australia in numerous ways and the success of Australia’s multicultural population can be seen across the country in our strong and vibrant economy as well as the rich and diverse fabric of our society. The success of Australia’s migration program has been achieved through the maintenance of a suitable balance between economic and social objectives. On the one hand, government is committed to the attraction of significant numbers of highly skilled entrants who contribute to the economy as soon as possible following their arrival. On the other hand, it is accepted that certain classes of migrants, including those from a refugee background, need more assistance to achieve their full potential. This is to be expected because these migrants have not been chosen on the basis of their economic characteristics; these streams meet broader social obligations, supporting social cohesion and Australia’s role as a global citizen, and are not intended to yield an immediate economic gain. This does not, however, mean that these entrants and their families cannot, and do not, contribute to Australia. Indeed, considerable research has been undertaken which demonstrates the capacity of migrants from a refugee background to become fully engaged with Australia on economic and social levels, to the mutual benefit of all. The OECD point to this as the dividend of Australia’s humanitarian commitment to the resettlement of refugees. The group of humanitarian arrivals represents a diverse range of ethnicities, from varying age groups and possessing different levels of education, work experience and English-language ability. The top source countries include Iraq, Syria, Myanmar, Afghanistan, many African nations and, most recently from across Central America. Refugees bring amazing strengths, knowledge, wisdom, resilience, and lived histories to their newly settled lives. People from refugee backgrounds bring with them their own skills and capabilities and an eagerness to contribute and give back to the communities who have welcomed them. Refugees who have come to Australia are a very diverse group. Some have been professionals in their own countries and others commit to beginning a range of vocations and careers following their arrival. For example, most people here will have heard stories about former refugees who are teachers, lawyers, nurses, doctors, actors, comedians, artists, tradies, community workers and public servants. Some of these people came already equipped with educational and work experience qualifications – for others, a strong commitment to education following arrival in Australia has facilitated their capacity to contribute. This is not to say that they don’t face a number of challenges in their settlement journeys however. Leaving everything behind in one life and beginning another in a different country with different laws, different education and health systems, different languages and different cultural expectations requires a period of adjustment. For people who seek asylum and refuge this process is all the more difficult due to the circumstances under which they depart their home country. Humanitarian entrants receive services that aim to help them overcome these challenges and reach their full potential in Australia. The federal Government funds settlement service providers to deliver a range of settlement services to migrants from a refugee background immediately on their arrival in Australia and for a period of up to 5 years. State and Territory governments supplement that federal funding, and importantly also support those who fall outside of the federal government’s scope. For example, here in the ACT, much credit is owed to the government for its support for asylum seekers in the community, and the benefits they receive as they await an outcome on their visa applications. Over 100 organisations operating across Australia deliver settlement services. In the ACT alone, a range of service providers who are represented here today combine to ensure refugees are well looked after. The prevailing consensus amongst these agencies and migrants themselves is that settlement is multifaceted and complex. Effective settlement is not an economic process alone. It also has social and personal elements. Settlement can therefore be viewed as a personal transition for migrants as they develop a sense of belonging in their new community. Work conducted by the Settlement Council has identified that settlement in Australia requires 6 key ingredients. It requires that a migrant be independent secure and accepted in their social interactions, economic engagement and personal health and well-being. I don’t have time to go into each of these factors but I wanted to leave you with one briefly, which is of particular relevance to this year’s theme for World Refugee Day. That is, acceptance. The notion of acceptance recognises that Settlement is a two-way process, requiring both migrants and the receiving community to commit to inclusive and common practices and values, without precluding the celebration and practice of one’s own culture. This outcome is crucial to successful settlement and fosters a harmonious and cohesive multicultural society. Acceptance, as a settlement outcome, requires freedom from racial, ethnic, and religious discrimination, as well as initiatives that welcome migrants and include them in all aspects of society. There is so much work being done in this space, and here in the ACT we have countless examples of activities, events and of course services that promote the social integration of refuges into the community. More can be done though, including fostering understanding and compassion and combatting a negative narrative that is promoted in certain elements of media and politics. At SCOA we are committed to sharing good news stories of the resilient, hard working and dynamic migrants who build their new lives here. 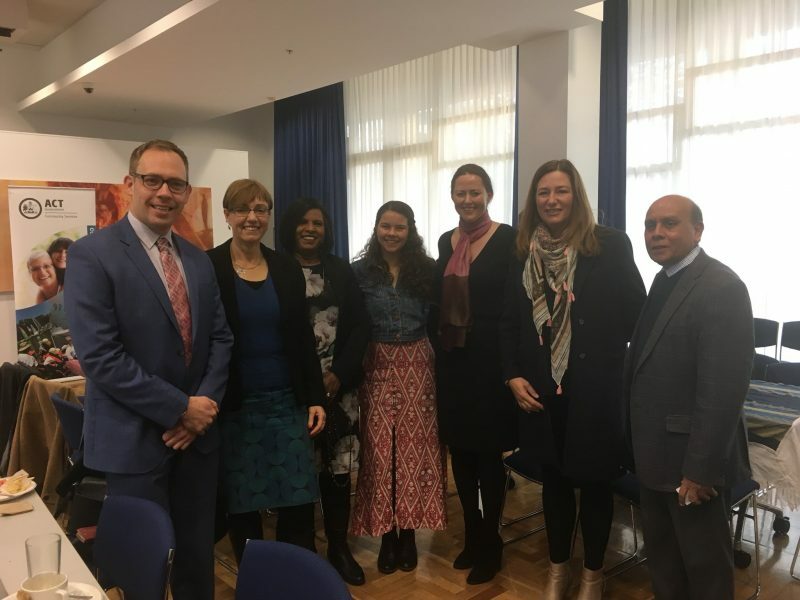 We see that refugees have much to contribute and will do so, provided they are supported in their settlement – which is where our members across the settlement sector come in. Gratefully supported by government, settlement service agencies are able to ensure tailored and flexible settlement services are provided and that refugees are able to achieve independence, and be accepted into the community, as quickly as possible. It is because of this crucial support that we are able to confidently point to the economic and social benefits Australia enjoys thanks to its compassionate refugee program, and that we are all able to confidently say our lives are enriched thanks to the new Australians that we welcome each year. On this world refugee day, let’s pay attention to the chosen theme: With Refugees. Never has there been a more important time for us all to embrace the most vulnerable, to include them, and most importantly, in each aspect of policy and decision making, ensure that we truly embody the theme of being there for those most in need.